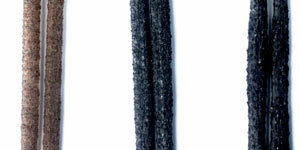 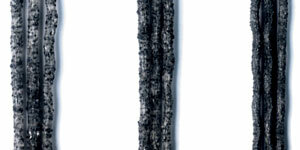 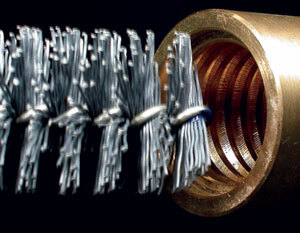 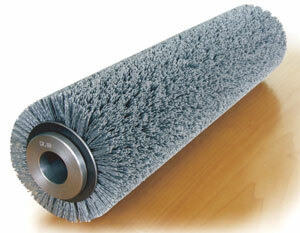 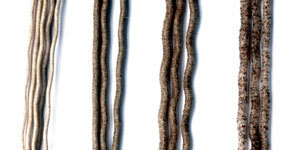 SIT has introduced for its range of brushes the new crimped abrasive filament HT150 resistant to high temperatures. 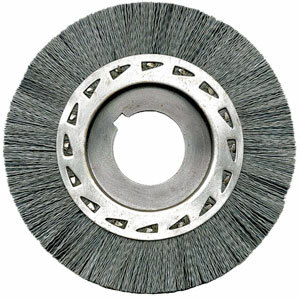 HT150 is able to work continuously at the temperature of 150°C and can be recharged with abrasive aggregates of different types and with grit of different size. 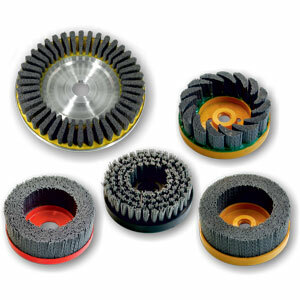 Our best advice is to use Silicon Carbide in general for all the applications that require a high material stock removal rate. 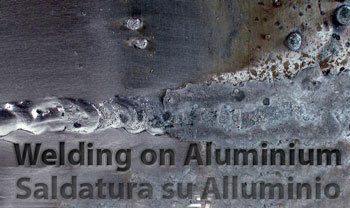 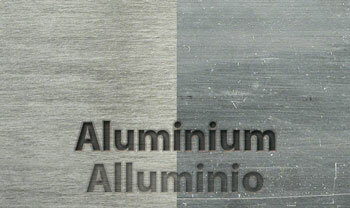 We rather advice to use Aluminium Oxide/Aluminium Silicate where the Silicon Carbide is too aggressive or may cause contamination in some applications on non-ferrous materials (soft materials, wood, plastic materials, aluminum). 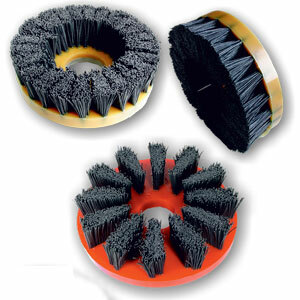 The effectiveness of the brushing varies depending on speed, pressure, density/wire protrusion and above all type of filament. 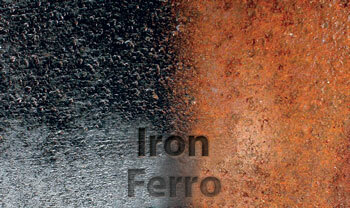 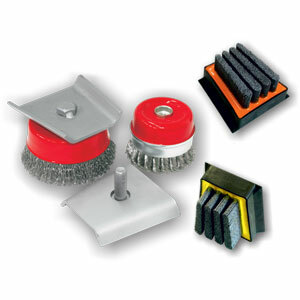 The grits 120 and 180 can be used in most applications and anyway as the first verification the surfacesal treatment, after which depending on the level of finishing required, you can opt for a more appropriate grit. 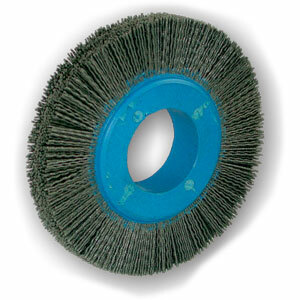 The metallic filament brushes remove the material “by impact” while the brushes with filament in abrasive nylon act “by abrasion” so, in general, we advise to use lower working speed and pressure. 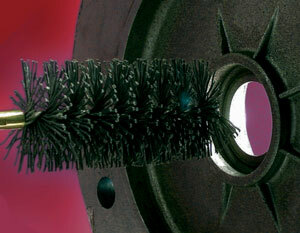 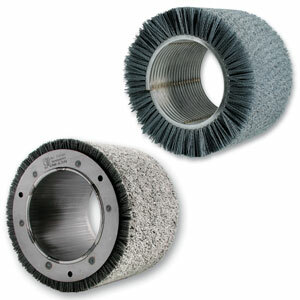 With wheel brushes in abrasive nylon you can obtain the highest brushing effectiveness and a long service life of the brush with work interferences of 1/8 of the extrusion. 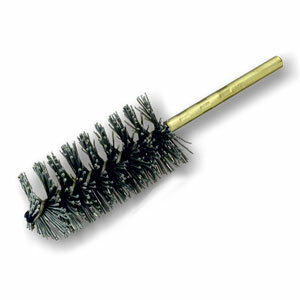 In case of front brushes use interference depth of 2 – 3 mm. 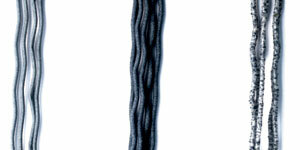 We anyway advice to start the job at the lowest possible interference/pressure, augmenting until you obtain the desired result. 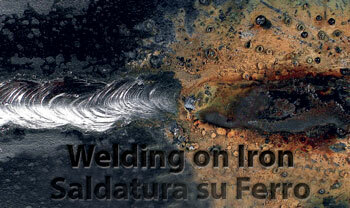 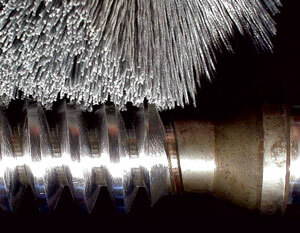 The speed optimization depends on the type of application and the type of brush in use. 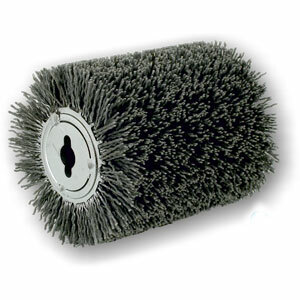 In general for wheel brushes we recommend peripheral speed not higher than 18 – 20 m/s. 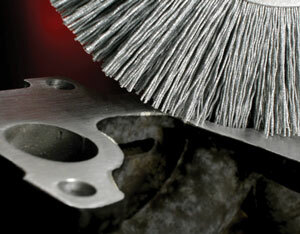 For front brushes use lower speed. 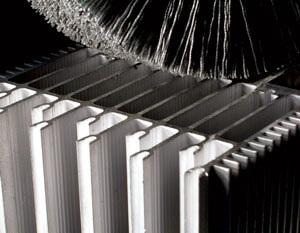 We recommend the use of coolers (filtered water) for heavy-duty applications to avoid the reduction of the characteristics of mechanical resistance of the filament and to obtain more glossy finishing. 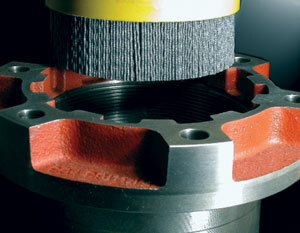 Reducing the advancement you can obtain: maximum angles spoking, complete burrs removal. 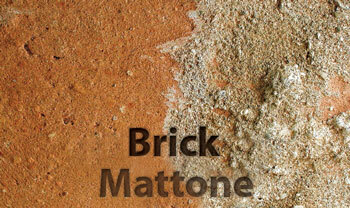 On soft materials you can have higher advancement speed. 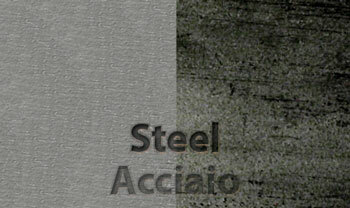 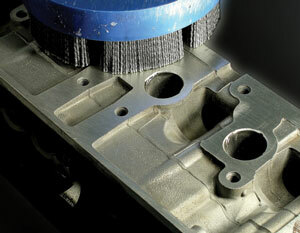 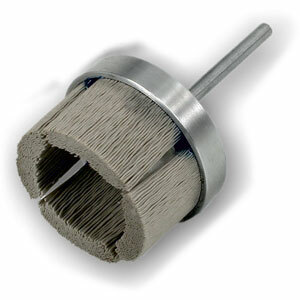 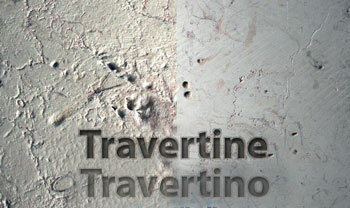 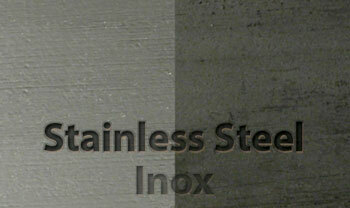 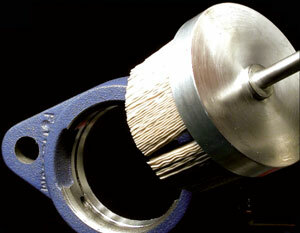 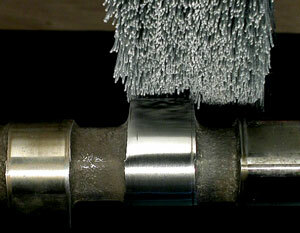 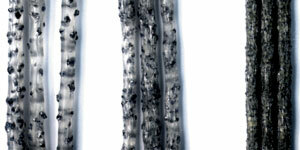 Technical Brushes SIT Tecnospazzole are designed to aggress any surface and process any material. 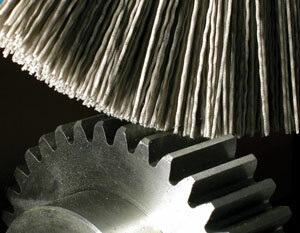 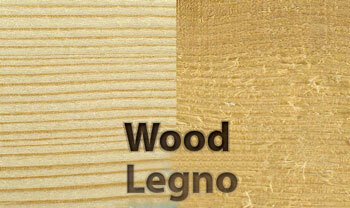 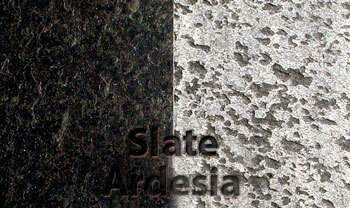 We report some examples of use of the abrasive nylon on some materials. 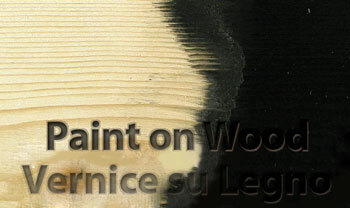 The examples are indicative and have been obtained depending on the material to be treated with brushes of different shape, grits and sections of filament of different types. 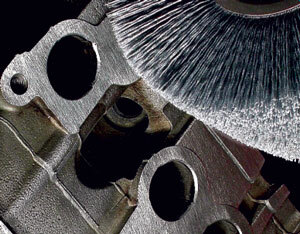 Our technical office will advice on the best type of brush to be used.